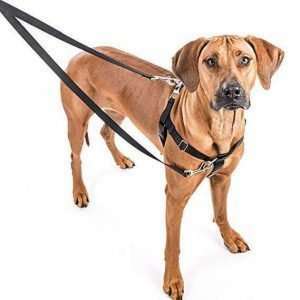 An affordable and effective harness which although fairly good – should probably be used in combination with a good lead and collar. 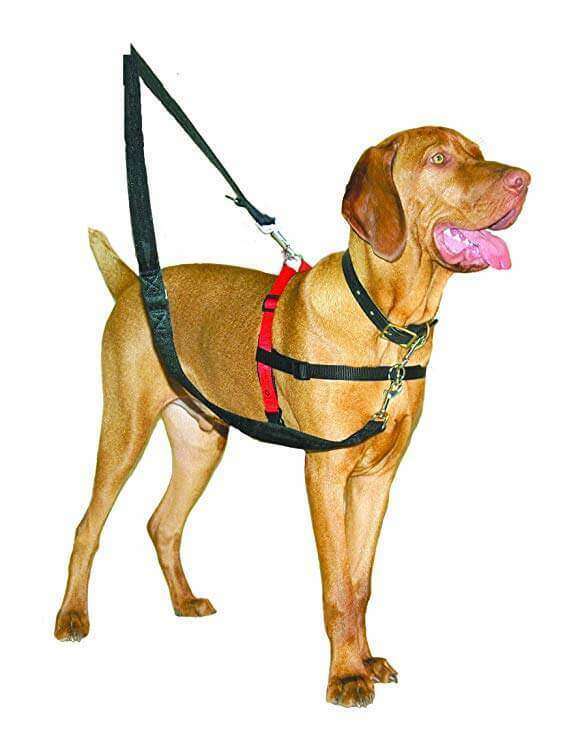 Company of Animals HALTI Dog Harness is the more affordable of the HALTI harness range. 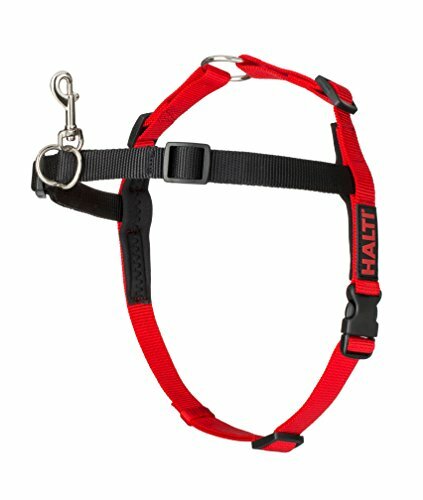 Like all HALTI products of this kind it is designed to reduce pulling in your dog. It also comes with a training guide to give you some useful advice on no-pull techniques. 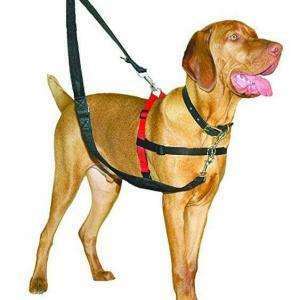 Often people buy the HALTI dog harness in combination with the HALTI training lead and HALTI dog collar but you may consider spending a little more on the next level up walking harness. It may not look it – but this is a chest harness. It has a lot less coverage and padding than most dog harnesses. That’s not a restriction, just functional. 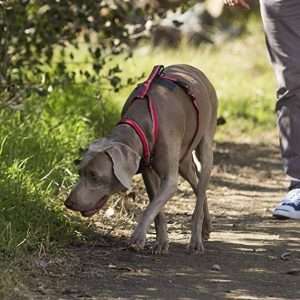 This is particularly useful for dogs who are no suited to wearing a head collar. Usually these are seen on dogs who are medium or large sized. This could be where my slight reservation for this harness comes in. Because of the simpler design – a lot of the force from a pulling dog (we tried this on a great dane) rests on a single, plastic buckle. Others had told me in the past that they had similar concerns in the ability of this clasp not to break. 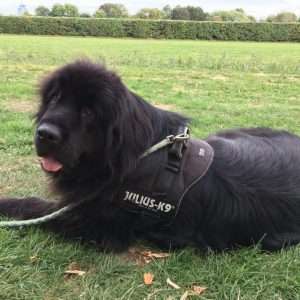 We didn’t have the issue – however it’s another reason you may want to consider not solely relying on the HALTI dog harness by itself (or consider a stronger one). 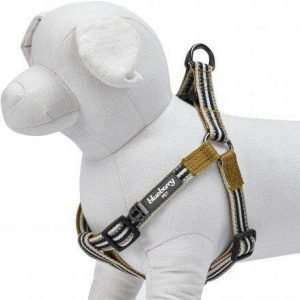 The front part of the harness can be used to attach a lead and there’s a safety clip for attachment to a collar. 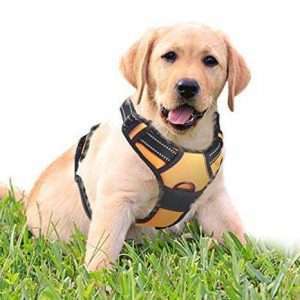 The main part is made of durable nylon webbing which is not only strong but won’t pull into the dogs skin. If this is your first chest harness, it benefits greatly from a traditional collar – particularly if you have a puller. Instead control is from the dogs chest and shoulders. 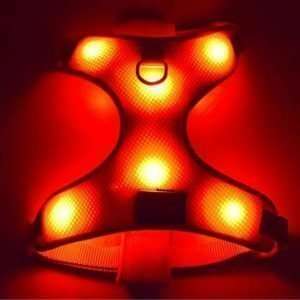 This makes it not only easier for you but less likely to cause unintended injury to your dog. The harness comes in three chest sizes. Small (11.5-23.5 in / 30-60 cm), Medium (23.5-31.5 in / 60-80 cm) and Large (31.5+ in / 80+ cm). As usual we recommend measuring your dog beforehand to get the right fit.